(Nanowerk News) Chemistry is now ready for the movies: an international team which includes researchers from the Max Planck Institute for the Structure and Dynamics of Matter in Hamburg has used a type of molecular camera to follow a fast-moving ballet performed by atoms in molecules as they change their structure (Science, "Direct Observation of Collective Modes Coupled to Molecular Orbital Driven Charge Transfer"). The researchers use a comparatively compact, efficient and low-cost technology for the detailed and slow-motion observation of how the miniscule atoms move at a molecular transition in a complex material. As is the case with all chemical reactions where atoms change position, such structural transformations take place in a few 100 femtoseconds or even faster – a femtosecond is a millionth of a billionth of a second. Although femtochemistry is already using recording technology for chemical processes, this has so far only been possible with large and expensive installations in which only selected research projects can be undertaken. "Just imagine you could observe how atoms move during a chemical process,” says chemistry professor Dwayne Miller enthusiastically. The Director, who hails from Canada, and his team at the Max Planck Institute for the Structure and Dynamics of Matter have been working on precisely this problem for many years. With their most recent research, the Hamburg researchers have come an important step closer to their goal. Chemistry today is still predominantly working with still-life pictures. Although it can derive very precise structural images of molecules using more and more refined methods, these provide only motionless reconstructions of the atomic positions which describe the state before and after a chemical reaction, for example. Theoretical models can describe at least the motions of small molecules during a chemical transformation. But as the number of atoms involved grows, the number of degrees of freedom with which the particles can move in reactions skyrockets as well. “These many degrees of freedom in chemistry can drive physicists crazy,” jokes Miller, who is well versed in both natural science disciplines. A precise theoretical calculation of many chemical systems therefore overwhelms any supercomputer. The Hamburg researchers can use their technique to film molecules, however, and thus show the rapid unfolding of an atom ballet in detail. For the researchers, this is as enlightening as a slow-motion video that captures the sleight-of-hand that a magician uses to conjure a rabbit out of a hat. Dwayne Miller and his colleagues have had to overcome enormous experimental challenges in order to develop the movie camera for chemical processes: atoms move extremely rapidly on the timescale of a few tens or even a few hundred femtoseconds – the time light would need to travel across a hair from one side to the other. The second challenge lay in the miniature size of the atom. Researchers must therefore be able to resolve at least one tenth of a nanometre - a nanometre is one billionth of a metre. “If one were to enlarge an apple up to the diameter of the lunar orbit, then one of its atoms would then be as large as the original apple,” Stuart Hayes illustrates the problem. The Scottish researcher leads a team in Miller's department that has just succeeded in capturing the video of a chemical atom ballet. Recording equipment for fast atomic motion has been around for thirty years or so and was responsible for establishing the field of femtochemistry. In the simplest pump-probe experiment, a “pump” flash of a laser starts the chemical process, a reaction, for example. It is followed by a second “probe” laser flash whose ultra-short femtosecond duration records the current state like a snapshot. 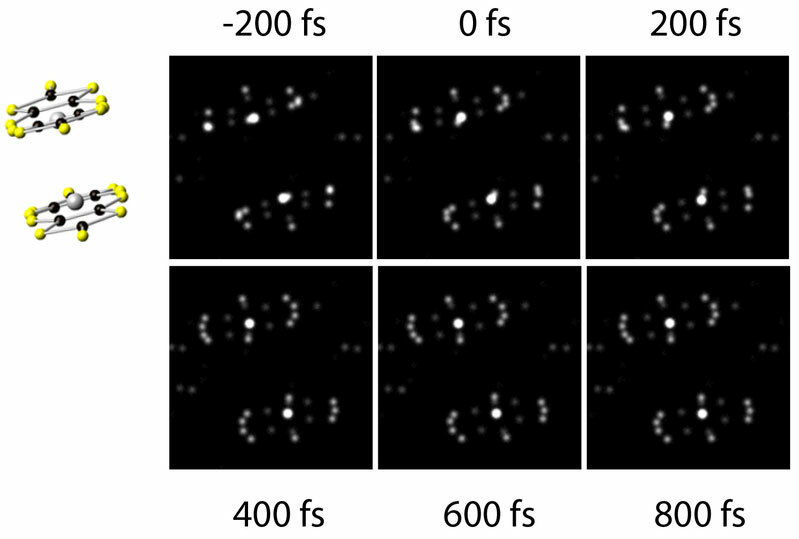 By varying the time interval between the two flashes, researchers obtain the individual images of a slow-motion movie. The method using two laser flashes has some disadvantages, however. The wavelength of the light must be very short so that the second laser flash can resolve individual atoms in the image. Normal lasers do not achieve these wavelengths from the extreme ultraviolet right through to the range of hard X-rays. Another difficulty is the required brightness of the second light pulse. “The shorter the exposure time, the brighter the flashes that you need,” explains Miller. These two conditions together mean that large, expensive installations, so-called free-electron lasers, are required. Their small number alone means that only relatively few research teams have access and only for a limited amount of time. From a chemistry point of view this is a critical bottle neck, because the magical tricks of many chemical reactions are waiting to be revealed. The idea: femtosecond electron flashes instead of laser pulses So, many years ago, Dwayne Miller had the idea of modifying the pump-probe method. He replaced the second flash of the laser in his “movie camera for molecular motions” with a femtosecond “flash” of electrons. Electrons have the advantage that they can directly image the positions of atoms in a molecule. As quantum particles, they have wave-like properties, just like light quanta. But their wavelengths are so short that they have no problem in detecting and imaging individual atoms even at low kinetic energy. They can be generated fairly easily in compact instruments. “These are real table-top experiments,” says Stuart Hayes. “Nevertheless, our electron guns are so bright that they can capture the molecular structure in a single shot,” adds Miller. Many of his colleagues had long doubted that this method would work with electrons. The problem is that electrons strongly repel one another because they carry the same electric charge. What starts out as a compact cloud of just a few thousand electrons thus runs the risk of expanding rapidly on the way to the sample. It threatens to illuminate the sample for too long so that the short flash time required for a femtosecond resolution would not be achieved. Miller’s group solved this problem by reducing the time-of-flight of the electron cloud, optimizing the number of electrons and using a kind of optics for electrons. Using this technique, the Hamburg researchers have now investigated a new molecular material: Me4P[Pt(dmit)2]2, which was recently developed at the RIKEN research institute in Japan. This belongs to an interesting family of materials whose electrical properties can be “switched back and forth” between insulation, metallic conduction, and in some cases even superconduction. This switching is brought about by temperature or pressure and is called phase transition. We know of phase transitions in everyday life, for example the change in ice which melts into water as it is heated. 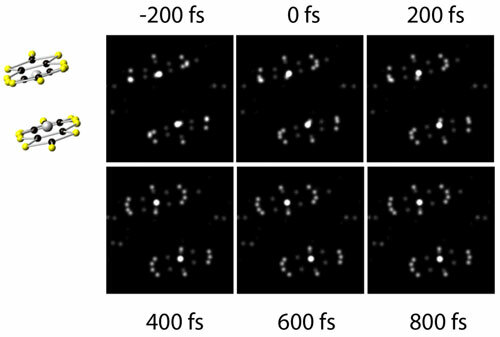 Tadahiko Ishikawa and colleagues at Tokyo Institute of Technology had recently observed the following: when Me4P[Pt(dmit)2]2 was exposed to a flash of laser light its optical properties changed in a similar way to the phase transition brought about by a change in temperature. It transforms from an electrical insulator to a metal. The researchers can gain a precise understanding of this photo-switching of the material properties only when they can follow in detail how the individual atoms in the molecules behave. The Hamburg researchers have now succeeded in imaging precisely this motion. “We see the motion of these atoms quite clearly,” says Miller, “like stars in the night sky.” It turned out that only specific groups of atoms collectively make a small number of coordinated key movements in order to change the properties of the material. Precisely that is the crucial insight for Miller: the thousands of possibilities are reduced to a few simple, basic dance steps of the atomic ballet. For Miller, the breakthrough to moving images represents a conceptual revolution in chemistry. As researchers make such fundamental visual observations of these atomic patterns of motion, they can understand chemical processes much better. The Professor compares the myriad of possibilities in a chemical reaction involving thousands of atoms with a mountainous landscape. The valleys represent different, stable molecular structures. In order for one structure to transform into another, it must go over the summit region into one of the neighbouring valleys. “The many possibilities then reduce to the path that is most accessible,” explains Hayes. These paths correspond to the few basic steps of the molecular dance, as revealed by the movies. “Our most recent molecular film is the culmination of years of work,” Miller says enthusiastically: “I could watch it over and over again.” Who knows, maybe these recordings will have a similar significance for the development of chemistry as the first films of the Lumière brothers which were the first time to capture our life in moving pictures.